Zip a bunch of files together in a single download. 2. Click the download button in the upper selection bar. 3. Select the Download Resolution you wish to receive. All of the selected files will be downloaded together as a zip file. They will go automatically to your computer's default Downloads / My Downloads folder. If the resulting zip will be over 100MB you will be emailed a link to the zip, rather than having to wait on the download screen. 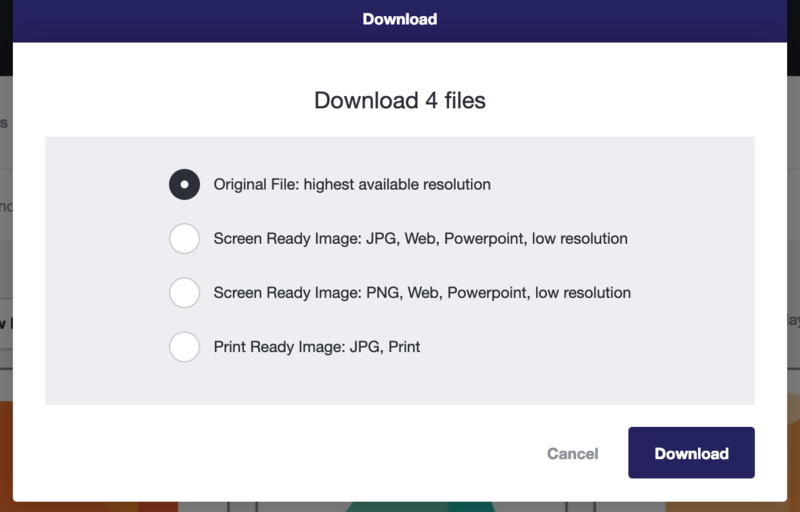 Because they are all being downloaded at once, you will only be prompted to select the Original File or the system's resolution conversions. You can not access any attached files in a bulk download. Original File: The highest available resolution. This is the original file uploaded to Image Relay. Screen Ready JPG: 72 dpi RGB JPG sized down to 5"x7" if possible. Screen Ready PNG: 72 dpi RGB PNG sized down to 5"x7" if possible. Print Ready Image: 300 dpi JPG in color format of original sized down to 8"x10" if possible. Download resolutions are dependent on your assigned permission. If you are not presented with the Original or Print Ready conversion options, then you have been granted low resolution download access. If you require access to a higher resolution file, please reach out to to your master user.